← Sad News: Goodbye Angel Beats? Will contain spoilers to Tokyo Ghoul anime. Also, please support the previous OWLS blog tour post from Moonid. It’s usually said that violence is never the answer; however, in most cases, it can be the only way to resolve issues. In human history, there has been well-known examples where violence and resistance have affected the thoughts of mankind. During the Civil Rights Movement, people like Rosa Parks and Dr. Martin Luther King Jr. have dealt with violence from white people just because they were colored. Racism usually leads to violent behavior and people caught in violence leads to hate one another. 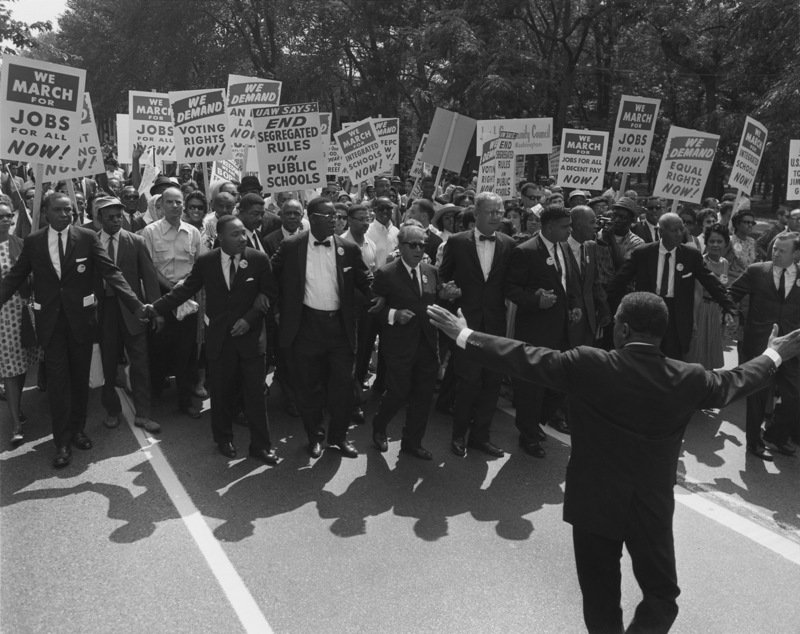 However, people like Parks and Dr. King refused to fight with fists and decided to fight without hurting anyone. Rosa Parks refused to obey to give up a seat for a white person and Dr. King fought and stood against the crowd by following his dream that whites and blacks will come together as brothers and sisters. These kind of people showed that violence is not needed to end a dispute. Unfortunately, sometimes that is not enough and violence is needed to end it all. 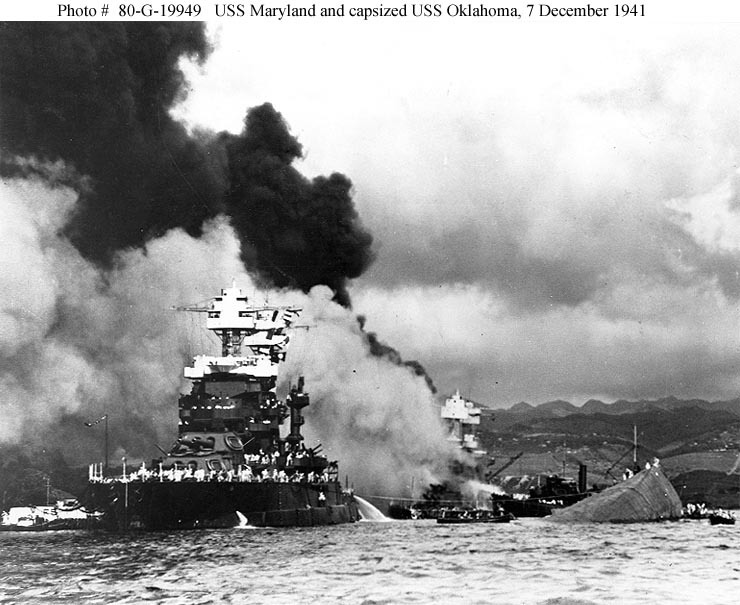 In America history during World War II, when the Japanese attacked Pearl Harbor where the American soldiers resided, America was forced to join in the war and fought against their attackers. World War II was a very violent war for not only with America and Japanese, but also with Russians and the Germans. With the war reaching the peak, America decided to do the on thing that would ensure victory: dropping the atomic bombs. America dropped two atomic bombs on not on Japanese soldiers but on residential homes in Hiroshima and Nagasaki. Millions of innocent lives were lost and this caused the Japanese to surrender and thus giving America victory. Unlike the Civil Rights movement, sometimes violence will be the last resort when diplomacy is not enough. In this post, I will be talking about a young man dealing with an unwanted situation between both worlds. To start this topic, let me introduce to you what is Tokyo Ghoul. Tokyo Ghoul begins with the story of a young human college boy named Ken Kaneki. The story takes place in modern day Japan where ghouls exists and the war between humans and ghouls are secretly fighting. One day, Kaneki meets a lovely girl named Rize Kamishiro and the two decided to become a pair. One night, what was once supposed to be a date, turned grim when Rize was actually a carnivorous ghoul. Rize attacks Kaneki nearing killing him and with a blessing, Rize gets killed by an accident. In the verge of death, doctors decided to use the organs from Rize and implant them onto Kaneki. This is the death of the human and the rebirth of the hybrid of Kaneki. Now that Kaneki is part human and ghoul, he must learn how to survive from becoming a ghoul himself and also avoiding to get killed by those who want him dead or food. In this topic, I won’t be talking about a review as usual and I will only talk about the topic in this OWLS Blog Tour. Be careful because I will spoil the first season of the anime. Talk like a human first. Fight like a ghoul as last resort! Kind of like my previous OWLS post in Strength, Kaneki struggles with controlling his ghoul powers whenever he is in pinch. He first displays his humanity when he refuses to kill or fight anyone; however, sometimes he can’t reason with anyone and has to rely on his ghoul powers to stop the violence with violence. Here are some examples from the anime. During the second episode, Kaneki and Hide meets a second year student named Nishiki Nishio. Nishiki tries to persuade Kaneki to go home and he wants to be with Hide but Kaneki insists on going with them. In a dark alley, Nishiki injures and knocks Hide in unconscious and reveals to Kaneki that he wants to eat Hide. Kaneki, shocked, tells him to stop and even fights him with his human strength. Unfortunately, he fails and gets overpowered by Nishiki. Ultimately, Kaneki has no choice but to unleash his kagune (a special organ that allows ghouls to draw out powers and fight) and immobilize Nishiki. But the violence doesn’t stop because after he wins, Kaneki becomes feral like a ghoul and even he tries to kill Hide but thanks to Touka, he gets defeated and reverts back to normal. Skipping ahead to the episodes 7 and 8, after the tragic events with Hinami’s mother , Kaneki agrees with Touka to avenge the death Ryouko Fueguchi. Ryuoka was killed by two agents, veteran Kureo Mado and his sidekick Kotaro Amon, of CCG (an organization that kills ghouls). Kaneki and Touka split up and faces these two agents: Touka fights Mado while Kaneki fights Amon. During the fight with Amon, Kaneki fails to even inflict pain on him and there are moments where Kaneki tells him to stop fighting. Unfortunately, Kaneki is unable to reason with Amon and ends up nearly killed. During the fight, he realizes that sometimes seeing eye to eye can be hard and sometimes not everyone will be able think like him; he soon realizes the hate between ghouls and humans. Knowing that his words can’t reach him, Kaneki once again uses his ghoul powers to fight and win against Amon. What makes this fight interesting is that Kaneki, as of now being both ghoul and human, wants to be able to resolve conflicts without bloodshed but in the end, he ends up creating the violence to stop the first act of violence. 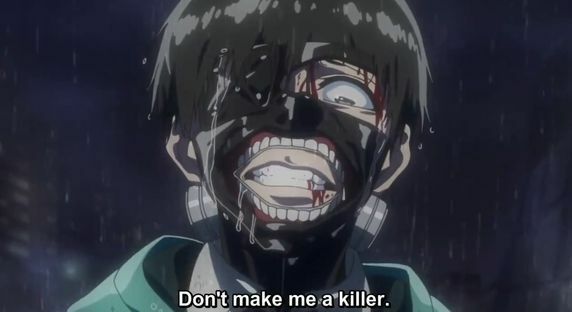 In episodes 11 and 12, Kaneki get’s kidnapped by a sadistic ghoul who goes by the name Jason; reason being is because Kaneki has Rize’s powers and her scent on him and Jason decides to use him as a “toy”and mess with his ghoul body. For 10 days, Jason tortures Kaneki with pliers and centipedes; Kaneki can only accept this abuse and cry for help. However, a ghoul couple, working with Jason, decided to hatch a plan to save Kaneki. Unfortunately, the escape plan failed Jason found out and then decided to use the couple for another method to torture Kankei. Kaneki had two choices for the couple: save the girl but let the boy die or the other way around. Kaneki decides that they should live but he dies; unfortunately, Jason decides to kill the couple and continue to torture Kaneki. In the last episode, in Kaneki’s inner thought, he has chat with Rize which later prompts him to unleash and embrace is ghoul powers and defeat Jason. Good people will suffer, will you fight or die? Going back to the second point with Kaneki and Amon, I did some careful thinking on episode 8. During the fight with Amon, Amon asks Kaneki if ghoul’s ever thought about the humans they consume and do they enjoy bring pain but Kaneki respond back that sometimes it would be better if humans could understand ghoul’s feelings too and the reason they are here because they lost someone. Unfortunately, Amon doesn’t take it and disregard Kaneki and believes that ghouls are the bane of existence. What I like about this part in the anime is because Kaneki doesn’t want to kill Amon. All he wants to do is show that ghouls are like humans who have emotions and love, but according to Amon, ghouls are killing machines with no emotions. Thanks to being a half-ghoul, Kaneki tries to reason to Amon as a human with his cursed appearance. If you were take this to the real world, it doesn’t matter if you are colored and what sexuality describes you, we are humans with emotions and intellectual thought. Kaneki could be represented as people who wants change like Dr. King, Rosa Parks or any leader and Amon represents people who blinded because of ignorance. Unfortunately, this act of diplomacy is crushed and Kaneki has to use brute force to stop fighting and causes him to shed tears for his enemy. In the 12th (final) episode in season one, Jason continues to torture Kaneki and Kaneki is trapped with nothing to do but cry in pain. While being tortured physically and mentally, Kaneki wanders in his subconscious and sees the source and cause of his powers, Rize. We also get to learn about Kaneki as kid such as that his father died and leaving his mother to be a single parent. It is described that his mother was very kind woman unfortunately, her kindness was being misused when her sister (we find out that Kaneki’s aunt is abusive) needed “financial help”; his mother kindly gave her money and this made her work a lot harder to help her sister and raise Kaneki thus resulting her to die from work overload. Rize also points out that if Kaneki would have unleashed his powers or done something for the ghoul couple, at least one person would guarantee to live; it’s better to sacrifice something rather than dealing with something on your own and getting blamed for an unjust cause. We learn also from Kaneki that he believed that if he is only one getting hurt, no one would have to suffer his fate. Once again, if we would to apply this to us, we will learn that sacrifices are needed to end disputes. It’s one thing to accept pain or suffering, but taking all the blame is not going to solve everything. No matter how much kindness you give to others and how much you to bear the burden, we all have to accept the fact we won’t appeal to everyone and you might have to pick a side. 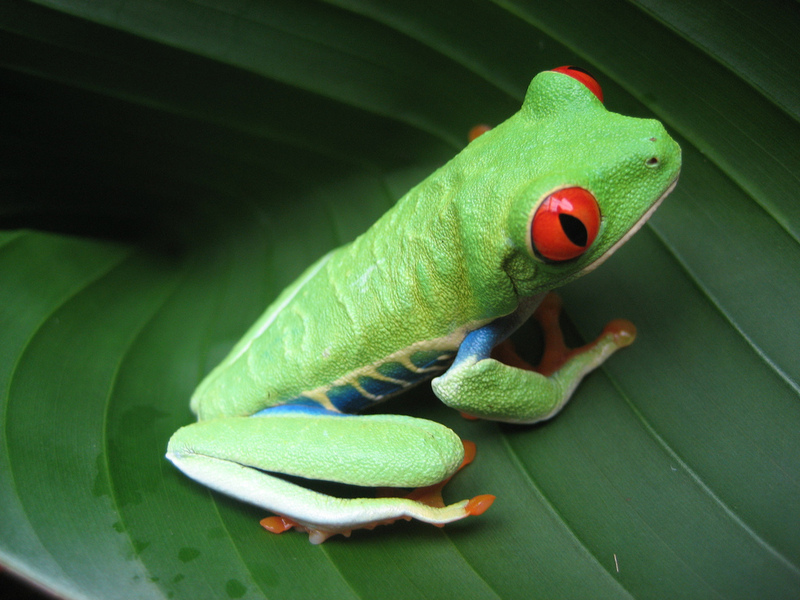 In most situations, when picking sides, there are few people would rather stay neutral because they don’t want to hurt anyone, but ultimately, that can also hurt them as well since it also shows that they won’t show any support. What is the difference between a ghoul and human? Besides the physical aspects, ghouls and humans are the same in regards to emotions, thought and needs. They eat, sleep, love and fight. A ghoul can be caring and loving like a human mother and humans can be violent as a bloodthirsty creature in the night. Being part of two worlds, Kaneki deals with the hardship of trying to live both human and ghoul. He uses his ghoul powers to protect his friends and tries to act human in order to stop fighting with words. Just like mankind, he also has to fight in order to stop further bloodshed. What we can learn from Kaneki can be applied to us in the real world. When fighting in an argument, it is best to use words to avoid possible consequences in both sides but we shouldn’t be a punching bag either. Just like our old president Ted Roosevelt said “talk softly and carry a big stick”; which means if talking things through doesn’t work with your opposition, don’t be afraid to use brute force. Now in 2017, President Donald Trump would rather talk big and carry a twig; he would spit out nonsense that could easily trigger another war without thinking the consequences. It’s up to us to remember that sometimes we have to sacrifice getting out of our comfort zone and fight for what we think is best for both sides. We might get hurt but it’s better to be scarred and standing than being dead and letting out enemy walk over us. Thank you for reading my post. I am sorry if this was lot of information. I hope this was able to help understand out topic of this month. Please support the OWLS and support the next post from our member, Irina. Nice post. In the case of Kaneki vs Amon I really felt Kaneki needed to find other words to try to sway him. His first attempt to get through did fail and yes, he definitely needed to defend himself. However, dismissing the possibility that words could work and that they wouldn’t see eye to eye just because one attempt at covnincing someone had failed is kind of defeatest. Then again, maybe the time for Amon to hear someone had long since passed and maybe the message is more about when those words needed to be said to him and the words he heard instead. Thanks for sharing and I’m looking forward to the rest of this months’ Owls tour. You’re welcome and thank you for your input. I am not an expert but you are probably right about Amon. It has passed and I don’t think he considered what Kaneki said at that time. One of the best Anime I’ve seen, I can say. This is one of my favorites. Actually, his can be the first on my list. Not only because I love anime boys with white hair but the strong was so strog that it makes my heart uneasy, in an exciting way. Kaneki vs. Jason was my fave. scene in season 1(I think not only me). The anime also has lessons to learn on valuing life even though you’re different. The killings here, I can sympathize to those in our country. Well, I don’t think killing is the answer but violence, maybe I can still agree with it. This anime is something I like too. Killing is not usually the way to solve problems. It usually increases the hate between us. It’s best to try to talk it out and if that doesn’t work, we should fight. Great post. In a perfect world people would talk things out but sadly it just doesn’t work that way. In this era people don’t want to listen to an opinion that they don’t agree with or that makes them uncomfortable, often times they won’t get physical but they’ll get rather defensive and pretty much try to shut people up. In my experience some people have tried to get physical and it didn’t end well for them but most either try to shut me up because they don’t like having their views challenged and some pretty much throw a temper tantrum. Bottom line is people might never find a way to truly settle things completely peacefully. Yeah I agree. It’s really sad when you think about it. Everyone has an opinion or idea but some people won’t listen. It may take time but we should try to do something that doesn’t involve violence. People are already doing that but unfortunately one of the methods (censorship) is just as bad as violence. That’s the worse. It’s not good to block out ideas or content. This is liking the truth and believing lies. *like hiding the truth and believing the lies. Perfect way to show Kaneki’s fight between both worlds. He was in agony. And I love this show. Matt you are always awesome with these post. Aw thank you. I might be awesome but you are awesome too. I enjoy your posts and I like your topics. I felt like using Tokyo Ghoul because of Kaneki’s issue. It’s not easy living in both worlds, ghoul and human. One hates the other and Kaneki wants to bring order. I am just happy you like this post and I can help the OWLS.